^ Quickfacts.census.gov - Chittenden County - accessed 2011-12-06. 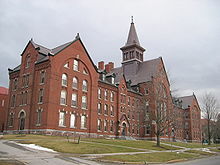 ^ Quickfacts.census.gov - Burlington, Vermont Archived 2012年3月27日, at the Wayback Machine. - accessed 2011-12-06. ^ Sutkowski, Matt (December 10, 2008). County shows its traits. Burlington Free Press.